There’s just a 1 in 80,000 chance of a baby being born still tucked inside its amniotic sac and this tiny twin’s “en caul” entrance is truly something to behold. A video uploaded to the Gih Flor de Lis Facebook page has us revisiting this miracle via a pretty amazing twin birth. Both twins were born via c-section and as the first twin was whisked away to be cared for by staff, twin number two emerged still tucked safely “en caul”. As delivery room staff (quite rudely!) poke and prod tiny newborn hands and feet through the amniotic sac, the baby seems blissfully unaware that she’s made her entrance. It’s obvious that the staff attending this birth were counting their lucky stars, stoked they were able to witness this rare and frankly awe-inspiring event. A lot of selfie-taking ensued! After all the photos and awe-struck marvelling, the baby is gently lifted from its mother’s belly with the amniotic sac still completely in tact. The footage of the infant curled up tight within is absolutely jaw-dropping. Little face, umbilical cord, limbs, hands and feet are all visible and it’s truly amazing to get a sneak preview of this baby before she fully emerges. These slowed-down en caul births really give us the opportunity to appreciate the amazing job mums do, growing beautiful, tiny people. It’s kind of like a step-by-step guide to entering the world. This particular clip doesn’t show the rather bracing moment the sac is ruptured and the baby is forced to face the world. We’re kind of glad because the suspense was getting to be too much for us and it was threatening to be a full blown hold-onto-your-ovaries moment. 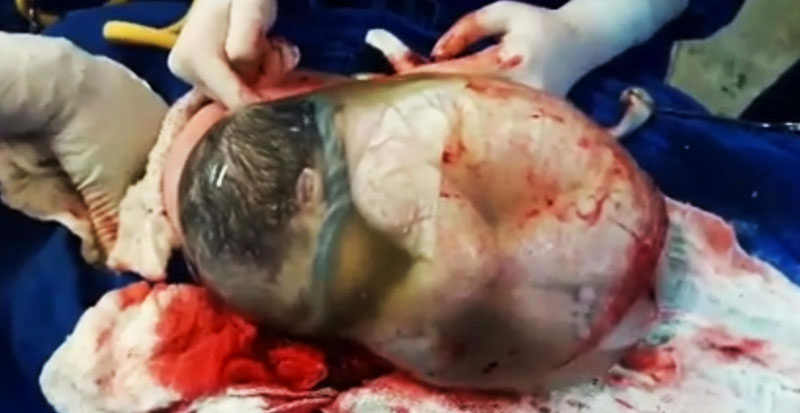 Some “caul babies” are born with remnants of the amniotic sac covering their face or body, but it’s a rare occurrence to birth a baby still completely tucked in the birth sac – “en caul” – like this. Babies born with part of the caul (sometimes called the veil) attached to their face or body have it removed post-birth by the attending doctor or midwife. These caul births are sometimes referred to as being ‘born with a veil’ or ‘born with a shirt’. Most “en caul” babies are born early and doctors say being immersed in the birth sac protects fragile babies from strong contractions. Some experts believe that planned “en caul” deliveries for preemie babies could have a whole host of benefits, ensuring vulnerable infants enter the world as gently as possible.